Our coach to Valencia this morning was a full sized sixty-seater as this trip had proved very popular. I had put a pair of swimming ear plugs in my pocket which I usually have in reserve for the showers. This morning however they would be used to block out the voices of our campsite intellectuals Mr & Mrs Guardian-Reader should they decide to continue their anti-Brexit remarks. The coach driver made good time and we were there in an hour, entertained most of the way by continuous songs by the Bee Gees. I assume the coach driver is a fan. The Old City, which is where we headed for, had very interesting architecture, and we both liked it all very much. However those interested in seeing the real Valencia should come at a different time of year, for this is the 'Fallas' celebrations. It seems to have its origins back in the time when farmers celebrated the end of the orange harvesting season. When it was over, they would pile high the wooden orange boxes used to gather them in, and set fire to them. This would ensure that no diseases remained in the wood to infect the following years harvest. Then one thing led to another and now it is a major celebration where large very detailed effigies made of paper maché, are paraded and burned this coming Sunday to the accompaniment of firecrackers. I suppose it's the Spanish equivalent of Burns Night. We popped in to Costa Coffee because you-know-who needed the facilities. I reckon I could save myself a fortune if I got myself catheterised. There were lots of people around, and this is Thursday, supposedly a working day for people, but not it seems for the Spanish. Wait until we leave the EU and stop paying our net multi-billion pound contributions. They'll all have to go and get themselves jobs, and there'll be no going off for a lie-down in the afternoons either. After wandering round for a bit we went in to the huge indoor market where there are apparently about three hundred stalls, almost all food. I bought myself a small black lambskin purse to put my Euro coins in. I cannot abide loose change in my pockets, and if I'm going to get mugged I really don't want them rummaging about down there for the coins. Next it was two filled rolls for €1 each, great value. We found a nice small park nearby where we sat and ate them in the sunshine. We then made our way towards 'Plaza Del Ayuntamiento' not too far north of the railway station and large bullring. From the presentation we had back at the campsite last week we thought we were going to see a parade of some sort at 14:00. Now I don't like crowds at the best of times, yet The Chef persuaded me to stand in the hot sunshine for a whole hour waiting for whatever it was to happen. We were gradually joined by thousands upon thousands of people, as far as the eye could see in any direction. It was hot, I had my sunhat on, sunglasses and a bit of The Chef's sunscreen on my nose as I hadn't bought any with me. I also put in my earplugs, even with them in it was still a terrible din, made worse by horrible Spanish kids letting off 'bangers'. Then it started - aerial firecrackers, then the noise built up and up, then I realised what I was about to witness - the first Spaniard in Space. We'd seen the rocket as we entered the square and thought nothing of it, but now it all made sense. The excited crowd looked skyward ready to capture that historic moment on their mobile phones. Their excitement was short lived though as the rocket failed to take off. I assume the astronaut had left the rocket and gone for his traditional afternoon lie down. The firecrackers continued for all of about ten minutes with the crowd clapping and shouting as the display reached its climax. And then that was that. I turned to The Chef and said "So that was it?" "That's what we've stood here for all this time?" Then all of those thousands upon thousands of people started to disperse. I tell you what. These Spaniards are easily pleased and get excited about almost anything. I bet the Local Authority have to turn the lawn sprinklers on in the middle of the night for fear of drawing a daytime crowd. We made our way slowly towards the bullring area to try and get away from the worst of the throng. We found a small park with an empty bench and sat down, taking a well earned rest. We left it about half an hour before going back in to the centre where it should be a bit quieter. Then there was more wandering around. There were bits The Chef wanted another look at, then it was the debate about where and when we eat. If we left it until we got back at 20:00 we'd have to buy a take-away meal from the campsite restaurant. Fish & Chips are on offer on Tuesdays and Thursdays so it would probably be that, but we felt it would be a bit too late in the day to eat. In the end we decided to get something in Valencia, though we weren't terribly hungry. The Chef remembered seeing a McDonald's on our wanderings, now hardly ever eat that sort of thing but it's usually good value and fills a gap. So it was McDonalds, and we settled for two 'Happy Meals'. 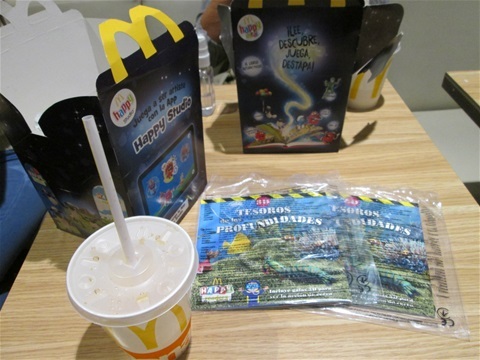 When The Chef bought them to the table they were obviously childrens meals. Nevertheless for €3.85 a portion we each got four chicken nuggets, a small bags of fries, a portion of ice cream with crushed M&M's on top and a Coca Cola. No doubt our fellow travellers on the bus coming back today had enjoyed delicious lunches of fine Spanish cuisine, but I bet they didn't walk out of their restaurant with a free colouring book each.